Everyone who has worked with American management can testify that the need to satisfy the pension fund manager’s quest for higher earnings next quarter, together with the panicky fear of the raider, consistently pushes top management toward decisions they know to be costly, if not suicidal, mistakes. We have been stressing for years that the cost to R&D within these shores will be something we will come to regret. R&D investment is crucial to productivity and that old-fashioned concept, prosperity, yet we’re treating it as an annoying child. 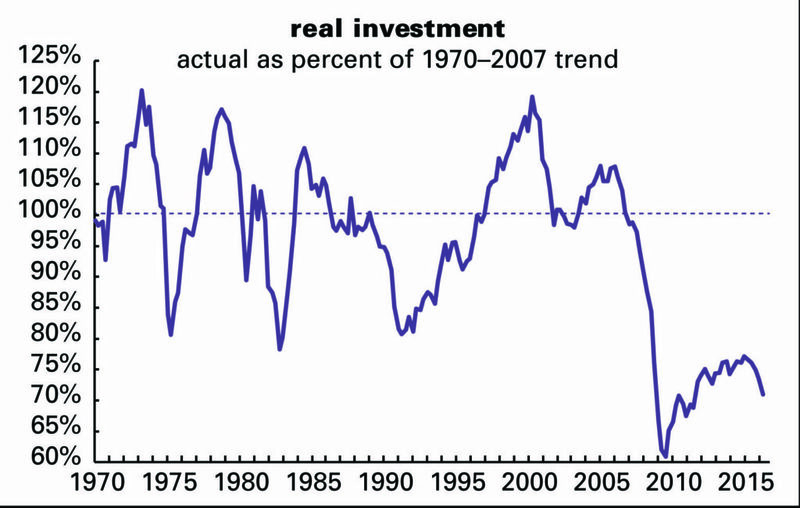 Looking at current investment as a share of its 1970 to 2007 trend might scare us awake. After collapsing in the Great Recession, it staged a recovery, but has been declining for the last year and is now just 29% of trend—worse than overall GDP (17% below-trend), consumption (15% below), and government (19% below).